Sometimes there is more than one way to connect a given group of atoms into a molecular structure. Given the formula C2H6O, two different isomers are possible: methyl ether and ethanol. They have the same formula but different structures. The word, "isomer", is from the Greek, meaning "same things", referring to their identical content. However, isomers often have very different physical and biological properties. These two compounds have different physical properties, as you can see in the table below. Remember, typical room temperature is about 25 °C. That means that at room temperature, dimethyl ether is a gas, because it is above its boiling point. Ethanol, on the other hand, is a liquid at room temperature. Ethanol at that temperature is well above its freezing point but has not yet reached its boiling point. Why is that? What is the origin for the differences in physical properties between these two, similar compounds, one of which is a gas at room temperature while the other is a liquid? Both contain carbon-hydrogen and carbon-oxygen bonds. The ethanol also contains a carbon-carbon bond and an oxygen-hydrogen bond. Certain bonds, or groups of bonds, confer specific behaviors on the compounds in which they are found. For instance, when an OH group is found in an organic compound, it can make the compound moderately acidic. It also makes the compound a little more likely to be a solid or liquid rather than a gas. Why? The dominant intermolecular attraction between ethanol molecules is hydrogen bonding. What we mean is, although two ethanol molecules may be attracted by London dispersion forces and even by dipoles, both of those factors pale in comparison to the attraction that arises from hydrogen bonding. Hydrogen bonding is the single most important factor holding two ethanol molecules together. In dimethyl ether, on the other hand, hydrogen bonding is not a factor. In this molecule, the major intermolecular attraction involves regular dipole moments. Because hydrogen bonds are typically much stronger attractions than ordinary dipole moments, a group of ethanol molecules is much harder to separate from each other than a group of dimethyl ether molecules. The ethanol has a much higher boiling point. Compounds don't really have to be isomers in order to compare them in this way. They just have to be similar enough that we can reasonably compare them. For example, propan-2-one or acetone, CH3(CO)CH3, has a boiling point of 56-57 °C whereas 2-propanol, CH3CH(OH)CH3, has a boiling point near 83 °C. Explain the difference. Different collections of bonds that are commonly found in organic compounds are referred to as functional groups. Functional groups influence the physical properties of the compounds in which they are found. They can also influence the biological activity of a compound; that is, they can help determine whether a compound might be active as a specific type of drug, a hormone, or other types of compounds that regularly interact with organisms in nature. In the case we looked at above, we were comparing an alcohol to an ether. In an alcohol, there is an OH group attached to a carbon. In an ether, there is an O attached to two carbons. (There are exceptions to these definitions: if an OH group is attached to a carbonyl, a C=O group, it is not an alcohol but a carboxylic acid. If an oxygen is attached to a carbonyl and to another carbon, it is not an ether but an ester.) In general, we can say that, because of the difference in intermolecular attractions, an alcohol has a higher boiling point than a comparably-sized ether. Two isomeric compounds, composed of exactly the same elements in exactly the same ratio, may have very different properties because of the different ways that the atoms are connected within the compounds. Another example of isomers is found by looking at the formula C3H9N. This time there are three different structures that can occur with the given formula. All three isomers contain the "amine" functional group. An amine is just a nitrogen connected to a mixture of carbons and hydrogens. Again, the three isomers have different properties, and these differences are not just restricted to melting points and boiling points. What factor do you think is responsible for these differences? The differences in melting points and boiling points are quite straightforward. The first example possesses no potential for hydrogen bonding. The second one does because it contains an N-H bond and the third even more so, because it contains two N-H bonds rather than one. Unlike alcohols and ethers, whether or not an amine contains an N-H does not change the name of the functional group. It is still called an amine. That may be an unfortunate artifact of history, because clearly an amine that can hydrogen bond is a little different from an amine that cannot, in just the same way that an alcohol is different from an ether. To compensate for that lack of distinction between amines, an additional adjective is used to describe them. An amine in which the nitrogen is attached to only one carbon and two hydrogens is called a "primary amine" (primary means one, as in one carbon attachment). An amine in which the nitrogen is attached to two carbons and one hydrogens is called a "secondary amine" (secondary means attachment to two carbons). An amine in which the nitrogen is attached to three carbons and no hydrogens is called a "tertiary amine" (attachment to three carbons). 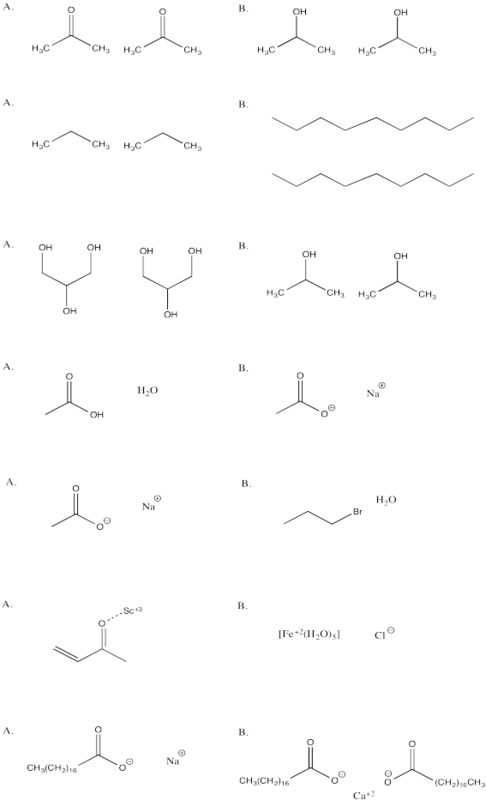 Isomers have a variety of properties that are different from the properties of other members of their group. Not all of these properties can be easily explained by looking at different structures, but some can. The density of a material is the ratio of its weight to its volume (in more "scientific" language: mass/volume). A material with a higher density than another can be thought of as having the same weight, but shrunken to a smaller volume. Alternatively, it could be thought of as having the same volume, but packed full of more mass. Note that the isomers in the table above have different densities. The densities in the table refer to liquid densities. Despite their similarities, the three compounds in the liquid state pack together a little differently. That, too, is a result of structural differences. Explain the differences between the densities in the table above. The values in the table all refer to the materials in their liquid states. Although this information is not noted in the table above, density values are usually listed along with the temperature at which the value was measured. That's because density is actually a function of temperature. Most materials become more dense as they get colder and less dense as they get warmer. Explain why density varies with temperature. There are other properties that can be compared and explained based on the structures of compounds. Vapour pressure is closely related to boiling point. It refers to the pressure exerted by molecules escaping from a liquid into the vapour phase. The more easily molecules can get away from each other in the liquid and escape into the vapour phase above the liquid, the higher the vapour pressure. The higher the vapour pressure, the more easily the liquid reaches the boiling point. In a simple sense, we can think of strong attractions between molecules holding them in the liquid phase and lowering their vapour pressure. Viscosity refers to the resistance to flow in a liquid. The higher the viscosity of a liquid, the more slowly it flows. Maple syrup is more viscous than water, but honey is more viscous than maple syrup. In a simplified way, we can think of molecules clinging to their neighbours as they flow past each other, hindering flow and increasing viscosity. Thus, the intermolecular attractions between molecules in a liquid affect its viscosity. It's a little like a group of friends rushing down a crowded street in Manhattan. If they all hold hands, they don't make as rapid progress as they would individually. Individually, each member of the group is able to step aside, dart forward and get past the oncoming pedestrians. Clinging together, they all have to turn, come to a halt and wait for people to let them past. Surface tension is a measure of how strongly a liquid resists external forces. You might think of it as how tightly the molecules in a material cling to each other when given the chance to cling to something else instead. The most familiar picture of surface tension is a drop of water. Water forms drops because the molecules in the water cling to each other more strongly than they do to the molecules in the air. Those are mostly nitrogen molecules, N2, with a significant fraction of oxygen molecules, O2. The molecules in the air are quite non-polar, because they are made of the same kinds of atoms: two nitrogens, for instance. There is no electronegativity difference that would impart a dipole to the molecule. That's in stark contrast to a highly polar water molecule; it's hard to find molecules more polar than that. If a water molecule were to interact with a molecule of dinitrogen, it would be trading in some strong hydrogen bonds with other molecules. That wouldn't be worth it. Explain the differences in the vapour pressures of the following compounds (listed in hectoPascals, hPa). Explain the differences in the viscosities of the following compounds (listed in centiPoise, cP, or milliPascal-seconds, mPa.s). Explain the differences in the surface tensions of the following compounds (listed in dynes/cm). You don't have to have data in front of you to compare two compounds' properties. At least to some extent, you may be able to look at two similar structures and make an educated guess about which one will melt or evaporate more readily than the other, provided they have different functional groups that you can compare. Knowing something about structure has explanatory value; you can explain differences based on structure. It also has predictive value: you can predict differences based on structure. In the following pairs of isomers, which one would be expected to have the highest boiling point? In the following pairs of isomers, which one would be expected to have the highest viscosity? In each of the following questions, you have a choice between A and B. Choose which option in which stronger attractions are present.